Michael Shannon, Joel Edgerton and Kirsten Dunst star in writer/director Jeff Nichols’ sci-fi thriller Midnight Special. Watch the movie trailer below! A father (Shannon) and his son (Lieberher) go on the run after the dad learns his child possesses special powers. 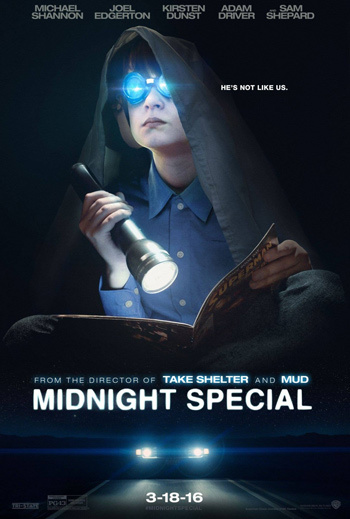 From “Mud” and “Take Shelter” writer/director Jeff Nichols, “Midnight Special” follows a father (Michael Shannon), who goes on the run to protect his young son, Alton (Jaeden Lieberher), and uncover the truth behind the boy’s special powers. What starts as a race from religious extremists and local law enforcement quickly escalates to a nationwide manhunt involving the highest levels of the Federal Government. Ultimately his father risks everything to protect Alton and help fulfill a destiny that could change the world forever in this genre–defying film as supernatural as it is intimately human.